On July 1st 2013, eight of us, including Tulku Sherab Dorje, began our journey half way around the world to Thubten Chokorling Monastery ("Sanctuary of the Dharma Wheel of the Muni's Teachings"). Fifteen hours of flight time and nine hours of driving later (three days in real time, including a visit to Kumbum Monastery outside Xining), following countless herds of yak and sheep, crossing over many pot holes and under many streams of prayer flags on the high mountain passes, we arrived at our destination. We were all a bit road worn by the time we arrived, but Hungkar Dorje Rinpoche, the abbot and successor to His Holiness Orgyen Kusum Lingpa (his father), gave us a warm welcome and offered us milk tea. 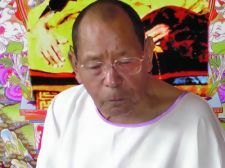 Before he left the following day for some teaching obligations in remote areas, he graciously accepted our formal petition and offering, from a group of 50 sangha members, with a request that he compose a longevity prayer for Tulku Sherdor. Early each morning, our group gathered to do Ngondro practice in the Jowa Temple. 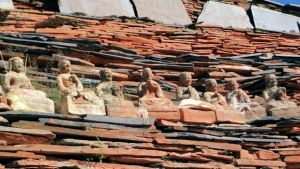 Otherwise, each day followed its own organic rhythm, as we would practice together or singly in different temples on the monastery grounds. We were privileged to visit and practice inside Lama Sang's personal shrine room on more than one occasion, which I would describe it as a very holy place, with a strong energy that somehow shook me but offered a very deep sense of comfort at the same time. 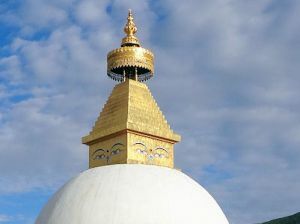 We regularly walked around the main Stupa and recited the King of Aspirations and other prayer on its steps. We received two days of instruction from the ritual master of the monastery, Lama Sonam Top; witnessed the assembly of nuns in their own gorgeous temple perform an elaborate Chod ceremony; were treated as honored guests (and stuffed with food) at the summer tent home of Lama Sang's eldest daughter (Hungkar Dorje's sister); watched the filming of an epic film on Gesar of Ling on the monastery grounds; received a Rigdzin Dupa empowerment from Hungkar Dorje Rinpoche; and had many other adventures along the way. Our vegetarian meals w ere provided by a group of nuns in a tent inside the residential compound of Lama Sang's wife, and they could not have been any kinder in caring for us. There even was a local vegetable from the area that was called, interestingly, the "local vegetable from the area." We took a day trip an hour and a half's drive away through some rough terrain to visit Do Khyentse Yeshe Dorje's Mani Doka,and the nearby sky burial grounds. There are stones pulled from the river bed that are naturally flat, and inscribed on each of these stones is countless prayers. People make a mold out of the ashes of their loved one and place it on the stones to bring blessings. The wall was over ten feet tall and roughly one hundred yards long. It was quite a site; the dedication to spiritual pursuit that the Tibetans have is something quite amazing. Other structures throughout the monastery reflect the same dedication and sensibility. There was also a three day trip with a large contingent from the monastery, led by Hungkar Dorje Rinpoche, to a sacred mountain range called Nyenpo Yurtse, where a local deity of the same name, bound by an oath to Guru Rinpoche, protects the Dharma. 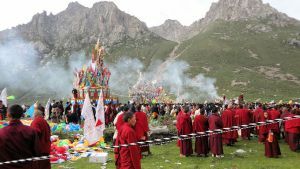 Groups from all over Golog and many regional monasteries came and joined in two days of fire offerings and propitiation ceremonies for the welfare of all. I was asked to document the local school at the Monastery, called the Hungkar Dorje Ethnic Vocational School. It provides a truly rare opportunity for Tibetans of the region to receive an education in their own language, and learn many valuable vocational skills. This turned out to be one of the best aspects of my trip, as I tried to capture, through video and interviews, what student life is like at the school, and what it means to preserve the Tibetan culture. I also must commend Fiona, a woman from Ireland who is teaching English at the school solely with the wish to help these students grow. I believe that if you were to ask each of the Golog Troop what the trip was like for them, you would get eight different answers. I believe all of us had an experience that we won’t soon forget. To have had the opportunity to take this trip was remarkable, and so I pay sincere homage to Thubten Chokorling Monastery, Lama Sang, Hungkar Dorje, his brother Dorje Trangpo, and Sherab Dorje for making the journey possible.